Here’s a delightful recipe conjured up by Andrew Plimmer to match with Misha’s Vineyard Limelight Riesling. The combination of tropical flavours and mango sit in perfect harmony with the lifted fruit character and citrus finish of the Riesling. This dish is perfect as a starter for a dinner party or as a main course. Pour yourself a glass of Limelight Riesling – it helps to have a sip as you are stirring the rice! Soak the mango in the hot water and then squeeze the juice from the orange into the water and set aside. Heat approximately 15ml of olive oil in a saucepan at a medium heat then add the Arborio rice, stirring constantly until the rice starts turning clear. Add 200ml of the wine and stir it in, then gradually add the coconut cream and then the mango and hot water, stirring constantly. Allow the mix to reduce slightly further than a standard creamy risotto and then remove from the heat, stirring occasionally to avoid scalding on the bottom of the saucepan. In a small bowl beat the eggs then prepare another bowl with the breadcrumbs. Once the risotto mix has cooled enough to handle take a small handful and roll into a tight ball in your hands, then breadcrumb with the egg and breadcrumb mix and set each ball aside until the mix has been used. Heat approximately 25ml of olive oil at a medium heat in a frying pan and shallow fry the balls until they are golden brown. Toss the salad leaves in lime juice and then serve as individual servings with a pattern of Aioli squeezed onto the plate. 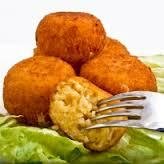 Place the Tropical Arancini balls on top of the Aioli, topped with a sweet or spicy mango chutney. Pour a generous glass of chilled Misha’s Vineyard Limelight Riesling and enjoy!